A Hartlepool care home resident is the inspiration behind a bid for this year’s Christmas number one single. Hartlepool born and raised headteacher David McPartlin has spearheaded the school’s bid to reach the coveted top spot with their song “Light Up”. Flakefleet Primary School headteacher David McPartlin and his'grandmother Doreen Ritchie. David, who runs Flakefleet Primary School, in Fleetwood, Lancashire, chose the Alzheimer’s Society to receive all proceeds from the sale of the song after his grandmother was diagnosed with dementia two years ago. Doreen Ritchie has lived at Queens Meadow Care Home, in Stockton Road, since 2016 and David visits her regularly with his three children. After releasing the single – which has reached as high as number 2 in the iTunes charts – David and pupils from the school travelled almost three hours and 130 miles to perform at his grandmother’s care home. The children and teachers sang “Light Up” to Doreen and other residents, carers and visitors. David McPartlin and school children with Radio 2's Chris Evans. David and his pupils have also met Radio 2 Breakfast Show presenter Chis Evans during promotions for the song. He said: “I didn’t know much about dementia. Now I want to raise awareness. The song was written by pupils and staff at the school with the help of two unpaid producers and was recorded in the studio of its sister high school. 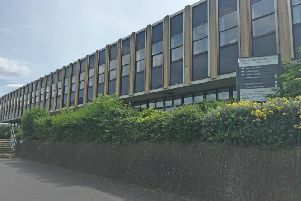 The music video was filmed at a care home local to the school, on the North West coast, and has since been viewed across social media hundreds of thousands of times. David’s mother, Kath McPartlin, who still lives in Hartlepool, said: “I am so proud of him and everything he has done for that school. “It is in quite a deprived area, so David and the other teachers are always trying to find ways to inspire the pupils. “The school regularly visits their local care home and David’s grandmother is at Queens Meadow Care Home, which is why they chose the Alzheimer’s Society. The Flakefleet Primary School song, “Light Up”, can be downloaded on iTunes, Google Play and Amazon Music.